This guide provides Ohio PreK-12 educators with information about ISearch integration and instructional support. Tell students that ISearch is a great place to start your research projects for school because it's full of resources that the library purchases and recommends. Show students INFOhio's ISearch for Students. Show students how to get to ISearch on the INFOhio website. Note: Check with your school librarian to see if there is an ISearch button or widget on your school library website. Log into the INFOhio website with your school's INFOhio username and password. If you are at school, INFOhio may log you in automatically. You should see the ISearch box on the INFOhio homepage. Demonstrate a search that uses simple keywords. Discuss the filters that appear in the left column on every tab of results. Point out the types of sources in the results (Source Type). Point out that students can limit by date, geography, and language. Demonstrate how to filter results to scholarly resources and how to turn off that filter. Point out the subject terms. Tell students that they can narrow their results to those subjects by clicking the links or use the subjects to come up with new search terms to try. Demonstrate how to access the full text of any article using the View/Download button. Show students the email and citation tools. Remind students that research is a process. They will need to try more than one search. Learn the basics of using INFOhio digital resources in Google's G Suite with this three-page guide. 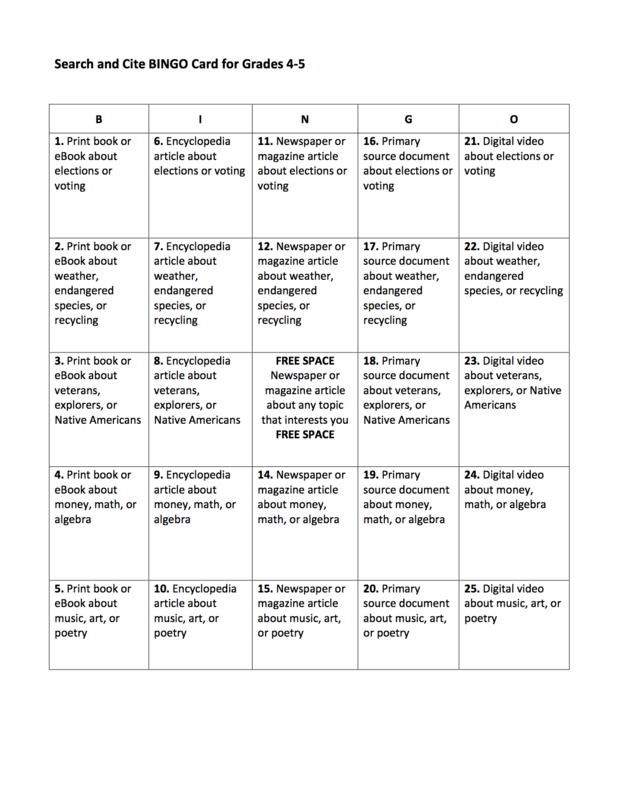 Revised with assistance from INFOhio Users Council members, ISearch BINGO can be broken into 3 separate activities which are listed below. Review the activities, and then download and print the documents you need. Use ISearch to learn how to search for resources. Compare ISearch with another search tool to find academic resources. Use ISearch to search for resources and cite them correctly. Designed by INFOhio Users Council members, this hands-on activity for grades 4-8 asks students to use ISearch to find the answers to questions about famous Ohioans. Provided for you to download and print is a teachers' guide, map template with questions, directions for students and an extended citation activity for students in upper middle school. INFOhio Users Council member and Ohio school librarian Amy Keister from Louisville City Schools created this activity perfect to get middle school students started in ISearch for exploration and research. Download and print to reproduce. Use this teachers' guide for the ISearch Exploration Activity. Download and print for ease of access. District/Building INFOhio Coach, Karen Gedeon, from Cuyahoga Falls City Schools created these activities for middle school students to begin exploring ISearch. Download and print the teacher guide and make copies of the activities. You can use these lessons with your local version of ISearch. Some may require modifications such as beginning with your local version of ISearch rather than your school library catalog. Instructional Bag-Grades 6-8: Money! Money! Money! The World of Finance!